The self styled “Master of Suspense”, Hitchcock remains one of Britain’s most prolific and successful exports to Hollywood, where he really came into his own as the director and producer of some of the most entertaining and well crafted thrillers the world has ever seen. He is one of the most talked about directors in the history of cinema, and my small contribution to the debate is hardly going to add anything new, but I would simply like to express a personal response to his bold and highly articulate work. Hitchcock worked for many years in the UK, between the wars, producing a number of interesting and well received films (including “Rebecca”, and “The 39 Steps” which he later remade) before he made the transition to Hollywood around 1940. It was in America where Hitchcock really managed to hone a personal style all his own, predominantly within the thriller genre. 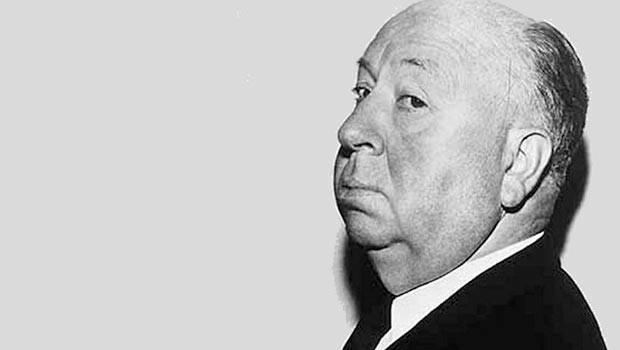 Hitchcock spent the best part of two decades opening up the genre to any and every trick in the book (a book that he was constantly rewriting) that serves as an inescapable legacy to the modern thriller. Hitchcock added innovation, complexity and genuine tension to all his films. This coupled with his penchant for self-publicity ensured that each one of his films were “event pictures”, always eagerly anticipated by the film going public. His films constantly broke new ground in both visual complexity (see the dream sequences in “Spellbound” and “Vertigo”) and plot construction and narrational control (“North by Northwest”) that culminated in his widely accepted masterpiece “Psycho”. Here Hitchcock delivered a terrifying and hugely subversive piece of modern cinema that loses little of its impact today, emphasising his total faith in the cinema to surprise and exhilarate. Hitchcocks’ continual concern for his audience drove him to great lengths in tackling the fundamental questions of cinema, combining entertainment with artistic relevance. He was always happy to undermine the expectations of his audience, predominantly with his self styled “MacGuffins”, a red herring designed specifically to misdirect. Probably the most shocking example of the “MacGuffin” is the fake plot line at the beginning of “Psycho” surrounding the stolen money, and the heroine’s death in the second reel. Hitchcock’s playful enthusiasm for his art also manifested itself sometimes in self-indulgence; he often placed himself in easy to spot cameos. Him walking poodles in “The Birds” is my personal favourite. Hitchcock made filmmaking appear effortless, almost ready-made, there is no clearer illustration of this than in the opening scene of “Rear Window” (My favourite Hitchcock film). The camera glides into an apartment, centring on various visual indicators, such as ornaments and photographs that expose aspects of the occupants’ life. The camera finally comes to rest on a sleeping James Stewart, constricted by a leg cast and confined to a wheelchair. This opening scene provides the viewer with all the necessary information about the protagonist, his character, his career, his environment, and his current predicament. It is one of the most comprehensive establishing shots in cinema history, and it is beautifully crafted. Hitchcock provides us with the indicators required to actively participate in the constantly pivoting drama that is to unfold. His films are poised on the edge of the grand revelation from the first reel, but he manages to hold it all together through subtle misdirection’s and wrong turns. In addition to his work as a director Hitchcock was a true student of the cinema, writing and speaking publicly on the nature of the medium and where it should be going. He famously spoke of the distinction between suspense and terror, and the role these two integral facets of the thriller play in his movies. He came to the conclusion that: “Terror comes by surprise, suspense by forewarning”. Hitchcock essentially lived his mature creative life by this phrase, steadily building long periods of suspense and suddenly puncturing them with abject horror. The most successful of these being, in my opinion, the crashing finale of “Vertigo”. Hitchcock’s legacy on both sides of the Atlantic is well assured. He has been well loved and fully analysed by three or more generations of film theorists and arm chair cinema buffs all over the world. The accessibility of his work has ensured a long lasting success. Moreover, from a fans point of view, his films stand as exquisitely crafted pieces of cinema, that express the unique nature of film which he always aimed to emphasise, lending very little from other artistic disciplines. Hitchcock decried films that were “too literary”, in their imitation of stylistic devices borrowed from the written word, he produced pure cinema, standing alone as a singular art form unlike anything else.